Two words that can overwhelm any momma-to-be. There is just so much to choose from nowadays, you get stimulus overload just browsing through Babys'R'Us. At least, I did. Really. I had to leave. So, a lot of my shopping was done by watching the other moms in my life and talking to them about their favorite items, or the items they would never buy again as well as the stuff the didn't use even once. I L.O.V.E. this round baby bed. We found it at JC Penney online. My parents bought this for us when we were pregnant with Samantha, and then stored it for us after we lost her, until Maggie came along. 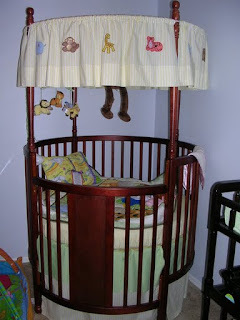 She is still in a cradle in our room, but very soon we will be moving her to her own room and into this awesome crib. We're starting to take naps there now, just to get used to the place. It's funky and fun, and a big space-saver, which is good for us as we live in a condo. This, too, is an Alison find. Hubby and I had talked about cloth diapering, especially after seeing how far they had come since we were both cloth diapered, plus, honestly, the whole saving-money thing was a big motivator. Alison and Johnny's son, Jack, is a cloth diaper baby, so I totally picked her brain on the ones she uses, how she liked them, were they easy to deal with, did the laundry drive her nuts, etc :) She gave them a glowing review, and since the opinion of one friend is better than 20 stranger-reviews online, we trusted and went with her choice, and have not regretted it once. (Well, maybe once. Or twice. When Hubby doesn't put said wet diaper in the bag and leaves it out for me to find later. That's always fun.) Plus, they grow with your baby so we don't have to buy a bunch of diapers in different sizes. The ones we have now we'll still be using in a year. We totally heart this stroller! 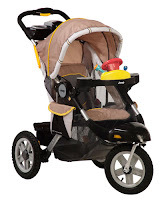 It's compatible with our Graco infant car seat so we didn't have to get a travel system, but were able to get both the car seat we wanted AND the stroller we wanted without feeling we'd had to 'settle' for anything. The height works for both of us - I'm 5'3" and Hubby is about 6'1" - so that's nice, too. Hubby's parents bought this for Maggie before our vacation in July and we took it all over California and had not one problem with it. Plus, their customer service is very nice. I called to have a wheel replaced because when we used it the first time one of them was totally wobbly and I thought it was warped. They sent out a new wheel the next day, no cost to us. Of course, I then found out the wobbly problem was because Hubby didn't put air in the tires. Seriously. He let me order a new wheel, then remembered he hadn't pumped up the tires. Sigh. I have no words. Accept no substitutes, folks. This little gem will be responsible for full nights of sleep for you, allowing you to retain your ability to function during daylight hours. I'm not even kidding! We still use ours. I sure am going to miss this blanket when Maggie starts rolling over and we have to stop swaddling. That will be a sad sad day for Mommy ... or maybe night. So, there you have it. My favorite baby gear items. Oh, and it's worth mentioning that, if you are expecting a baby, I found great deals at our church consignment sale ($3 changing table; $75 Medela breast pump; very inexpensive clothes), so don't rule out gently used items, so long as you can check them out first.